Rent Eldorado Hotel & Spa | Corporate Events | Wedding Locations, Event Spaces and Party Venues. The Eldorado Hotel & Spa is Santa Fe's premiere four-diamond luxury hotel that offers a unique experience including the acclaimed four-diamond restaurant The Old House and full service luxury spa, Nidah. If you want your next corporate meeting or your dream wedding to reflect the best of Santa Fe, look no further than Eldorado Hotel & Spa. 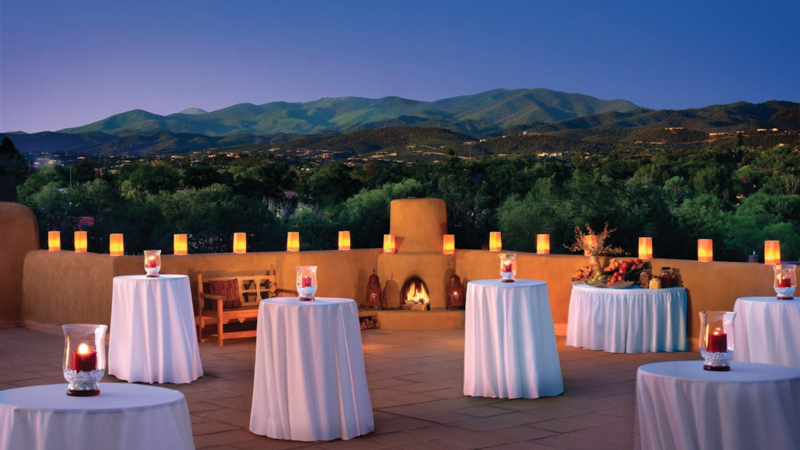 Santa Fe’s crown jewel offers stunning Santa Fe wedding venues, unsurpassed city and mountain views and elegant Santa Fe meeting spaces perfect for events large or small. Eldorado Hotel & Spa features 180-degree rooftop views and a variety of indoor and outdoor spaces. We are excited to offer two new spaces in 2015! Our new chapel features natural and customizable lighting, gold leaf detailing and elegance to make bridal dreams come true. Our new 7,000-sq.-ft. grand ballroom is the perfect meeting or banquet space. Our team is committed to making your grand event or intimate gathering spectacular. Our superior services along with our attention to detail make Eldorado Hotel & Spa stand apart from other locations for New Mexico conventions, weddings and meetings. Eldorado Hotel & Spa has received numerous honors, including the Smart Meetings Platinum Choice Award 2014-2015. Experience Santa Fe weddings and Santa Fe meetings at their best. Architectural details include an 15’ ceiling height, beamed and coffered ceilings, large multi-paned doors, traditional wainscoting and custom lighting fixtures.Our new 7,000 sq. ft. ballroom holds 700 for a reception or 580 for a banquet event. With close to 4,500 square feet, the Anasazi Ballroom is an ideal Santa Fe conference venue and meeting space in Santa Fe. This versatile space is perfect for memorable events, from a banquet for 250 to a reception for 400 or more to a convention with forty 8x10 exhibit booths. Zia Ballroom offers extra seclusion with less traffic than other rooms. It has 2,200 square feet of space for meetings, conventions, banquets or receptions. With 360-degree views of downtown Santa Fe and the mountains to the east as well as the sunset horizon to the west, the Presidential Patio offers superb style for any occasion. Each Boardroom is configured with the latest high tech equipment and capabilities including a wall-mounted 52" LCD HDTV with convenient compartments built into the conference table. During conventions, The Concourse serves as a space for up to 24 vendor booths and information tables. It also makes an outstanding reception area for up to 300 guests.